Now the hunt for more specimens of Laguna Woman is on! 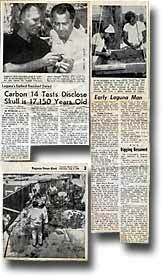 The possibility of recovering more remains from the same location where Howard found Laguna Woman in 1933 excited many archeologists, and a full-scale scientific exploration of the site on St. Anns street was launched. In the 35 years since the original discovery, more houses had been built along the street, but the long exposed bank of earth was still accessible, and the property owners were more then thrilled to allow the archeological team to dig up their front yards...provided they returned the land to it's original form. 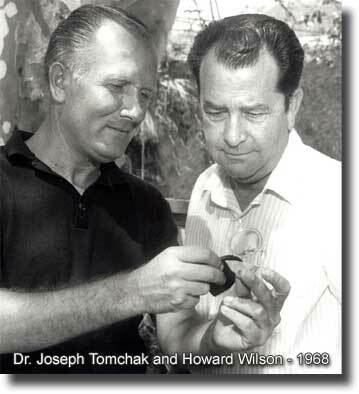 A team of professional archeologists were gathered together under the leadership of Dr. Joseph Tomchak, Professor of Archeology at Orange Coast College in Costa Mesa California, to conduct a through excavation the discovery site. Students from UCLA and other surrounding universities joined in with great enthusiasm. Throughout the summer months of 1968, the scientists carefully poured over every pebble and twig they dug up, searching for the tiniest clue. They found a few small pieces of "worked" stone, and many rodent bones and sea shells, but nothing more of any human remains. A geological assessment of the site showed that it was a 5-8 deep covering of earth that probably been washed down from the coastal mountains behind the town. This is probably where Laguna Woman came from too. She most likely died up high in a valley near the mountain top, called Hidden Valley, then later washed down to the present site during torrential rains. I'm writing it in fits and starts, so stop back by later to read the complete story. In the meantime, click on the newspaper articles below to read what was being said at the time. I'll present them better soon. Thanks!